Prepare both cake mixes according to the box directions. 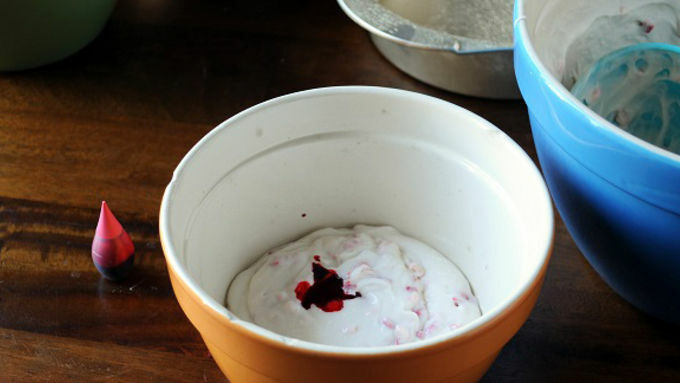 Add 1 1/2 cups pink peppermint baking chips to the prepared white cake mix. Fold until fully incorporated. In a medium bowl add two cups of the white cake batter. 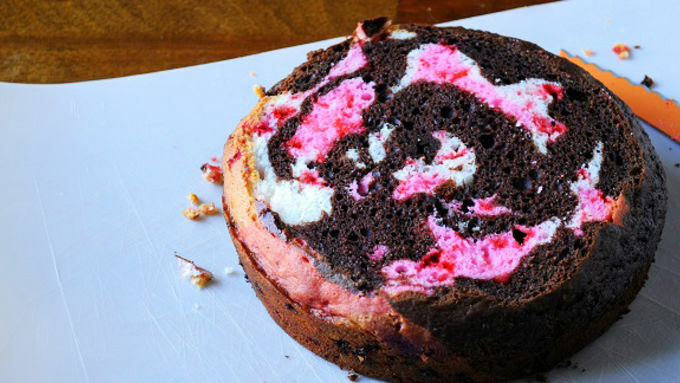 Add a couple drops of pink food coloring and mix until the batter has turned pink. 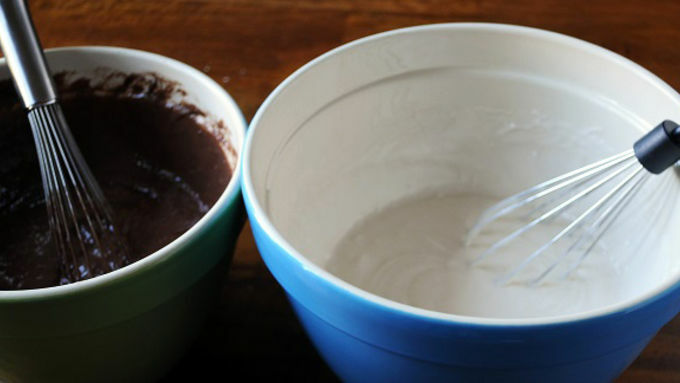 Pour one cup of chocolate cake batter into a prepared (with baking spray) 8-inch cake pan. Do the same to the other cake pan. Add one cup of white cake batter into the pan but not where the chocolate cake is. Do this in both pans. 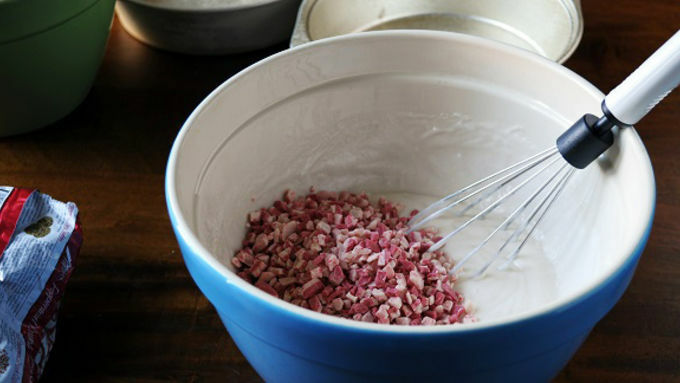 Add 1/2 cup of the pink cake batter into the pan over either the white or chocolate batter. Do this in both pans. 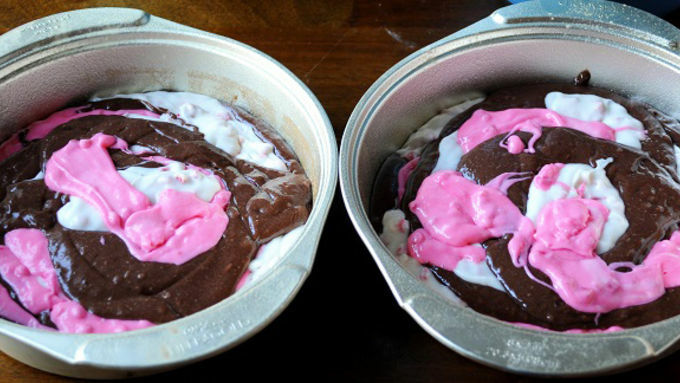 Keep repeating chocolate, white, then pink in each pan until you run out of batter. Just make sure you have equal amount of batter in each pan. Bake at 350°F for about 40 minutes (time will depend on your oven as each one cooks differently. Using a serrated knife, remove the rounded top of the cake so that you have a flat surface to work with. 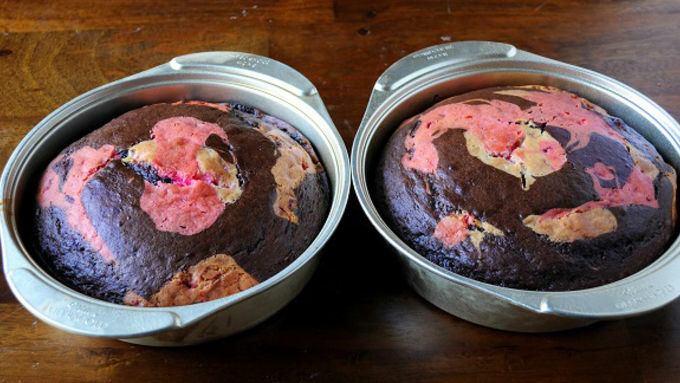 Do this to both cake rounds. You should have a flat surface and you can see the neat marbling effect of the cake. 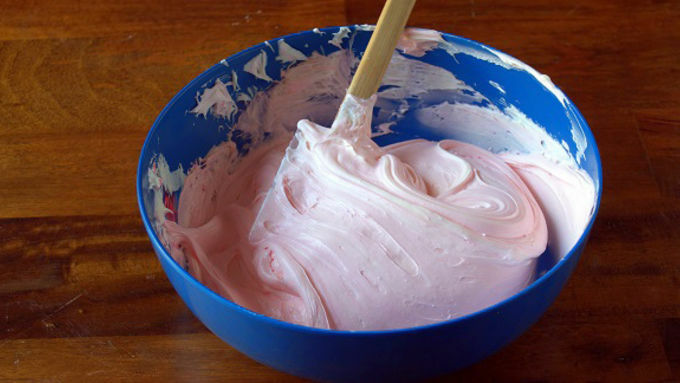 In a large bowl add the frosting, marshmallow fluff and a couple drops of pink food coloring. Mix until fully incorporated and smooth. Place the cake on a plate or cake turntable. 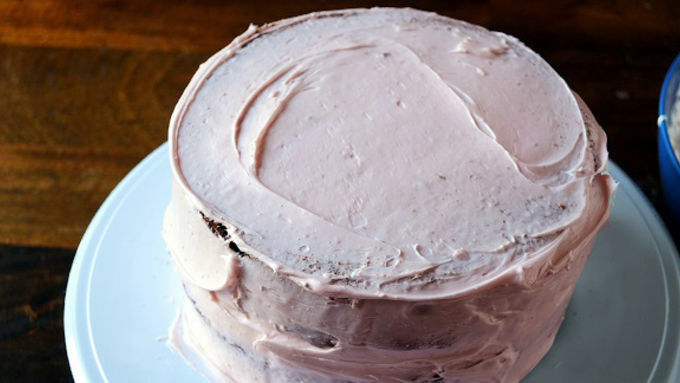 Add frosting to the first layer and frost all the way to the edges. Place the second layer on top of the frosted bottom layer. Frost a thin “crumb” coat around the whole cake. 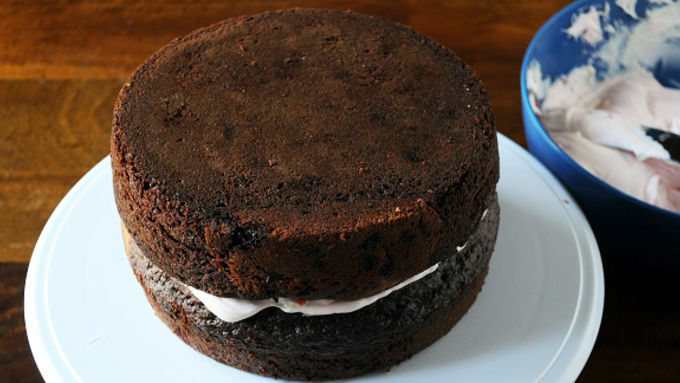 Crumb coating is a very thin layer of icing that will “glue” any crumbs down. Place in fridge for about 15 minutes. Frost the cake with the remaining frosting. 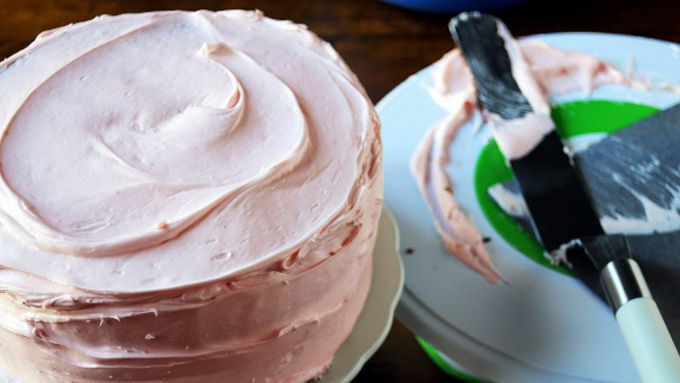 Carefully transfer frosted cake to a cake stand. If you frosted it on a plate and want to keep it on there then skip this step. 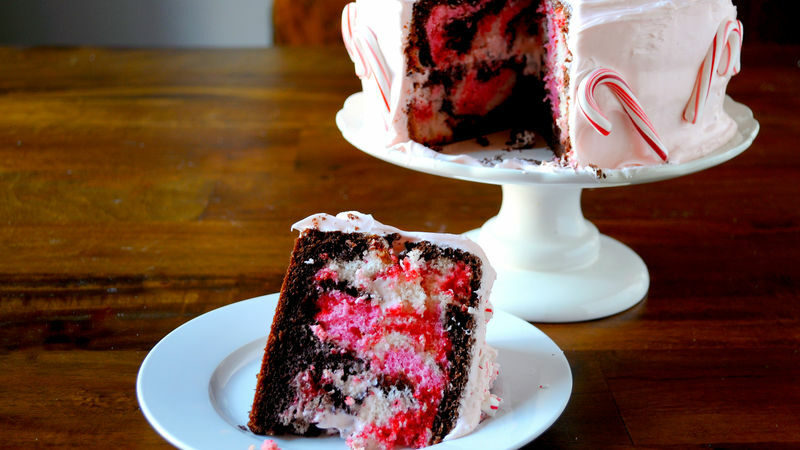 Add mini candy canes to the sides of the cake in any pattern you would like. 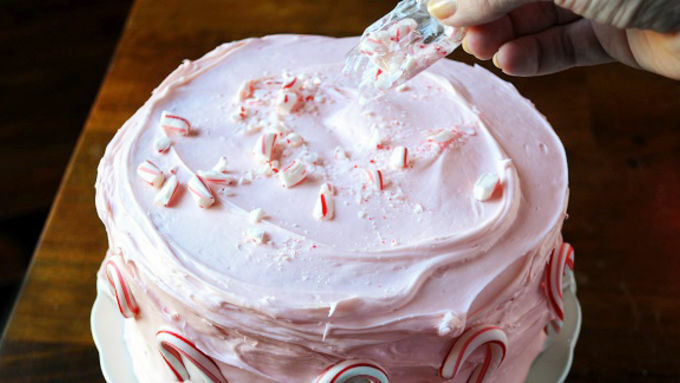 As a final touch, add crushed candy cane pieces to the top of the cake. The holiday season is upon us and it's time to get baking! 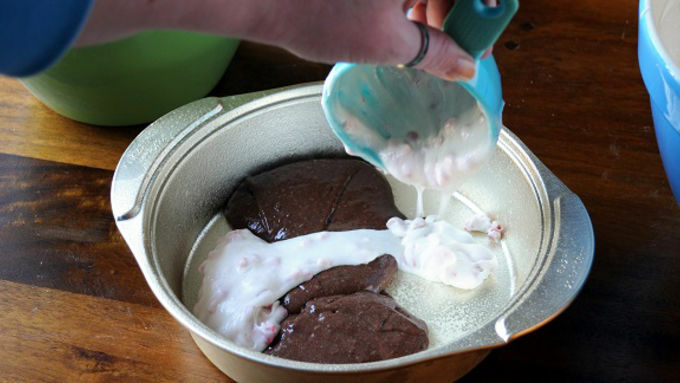 My Chocolate Peppermint Stick Marshmallow Fantasy Cake was a big hit, so I thought it would be fun to recreate it – but in a much simpler way, using Betty Crocker products. As you can see this cake is festive, whimsical, and totally fun to serve at a holiday party. We love to make it every year while we watch classic holiday movies! Grab a fork and enjoy a slice of festive, pepperminty, marshmallowy goodness!